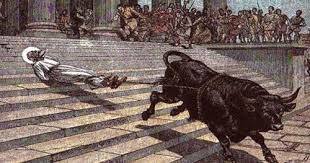 St. Saturninus was, says Tillemont, one of the most illustrious martyrs France has given to the Church. We possess only his Acts, which are very old, since they were utilized by St. Gregory of Tours. He was the first bishop of Toulouse, whither he went during the consulate of Decius and Gratus (250). Whether there were already Christians in the town or his preaching made numerous conversions, he soon had a little church. To reach it he had to pass before the capitol where there was a a temple, and according to the Acts, the pagan priests ascribed to his frequent passings the silence of their oracles. One day they seized him and on his unshakeable refusal to sacrifice to the idols they condemned him be tied by the feet to a bull which dragged him about the town until the rope broke. Two Christian women piously gathered up the remains and buried them in a deep ditch, that they might not be profaned by the pagans. His successors, Sts. Hilary and Exuperius, gave him more honourable burial. A church was erected where the bull stopped. It still exists, and is called the church of the Taur (the bull). The body of the saint was transferred at an early date and is still preserved in the Church of St. Sernin (or Saturninus), one of the most ancient and beautiful of Southern France. His feast was entered on the Hieronymian Martyrology for 29 November; his cult spread abroad. The account of his Acts was embellished with several details, and legends linked his name with the beginning of the churches of Eauze, Auch, Pamplona, and Amiens, but these are without historic foundations.